There was mild drama, this morning, at Eleko, Ibeju Lekki, as a lady was beaten for allegedly stealing a pot of food while it was still being cooked. According to an eyewitness, the owner of the food (the lady in Ankara) had stepped away to use the toilet, only to return to discover that what she was cooking had disappeared. .
After thorough investigation, it was discovered that the food was stolen by the lady in black. The suspect was then confronted by the owner and given some beating. Lady beaten for stealing a pot of food from the stove in Lagos . . 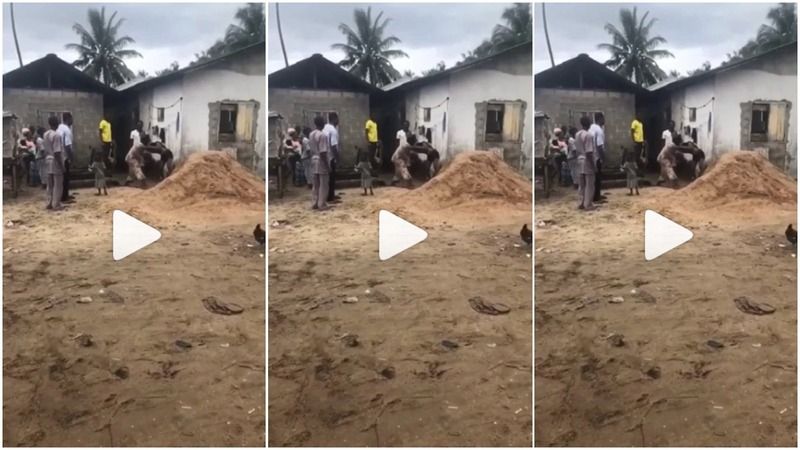 There was mild drama, this morning, at Eleko, Ibeju Lekki, as a lady was beaten for allegedly stealing a pot of food while it was still being cooked. . . According to an eyewitness, the owner of the food (the lady in Ankara) had stepped away to use the toilet, only to return to discover that what she was cooking had disappeared. . . After thorough investigation, it was discovered that the food was stolen by the lady in black. The suspect was then confronted by the owner and given some beating.